Last Friday me and my wife went to Stockholm to see Alison Krauss and Robert Plant in concert. One could say my wife was there because of Krauss while I was more interested in the hard rock icon from Led Zeppelin. I enjoyed the show, and though it had nothing to do with Elvis it made me think of him anyway. The second number turned out to be "Leave My Woman Alone," the Ray Charles song recorded for the Easy Come, Easy Go soundtrack back in 1966, but only as a backing track (released by FTD last year). 1. "Saved" was pushed by Bienstock for inclusion in the movie but not cut by Elvis at the time. 2. "We Call On Him" was also rejected because it did not have the revival spirit called for by the script. This made me think in the lines of "what if." What if Elvis had recorded "Leave My Woman Alone" as well as "Saved" and "We Call On Him" for the soundtrack? Then maybe the EP wouldn't have been an all-time low for Elvis, selling only a little more than 30 000 units. Or maybe it wouldn't have mattered. 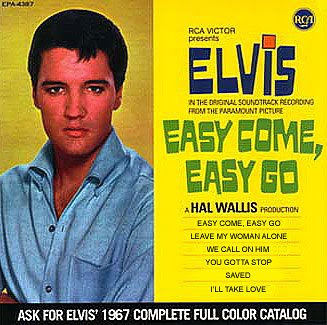 After all, Elvis doesn't sound all that inspired during the recording of the soundtrack, and a song such as "Saved" would've probably lacked a lot of the excitement so evident on the version from his TV special two years later. Still, the following track list does tickle your imagination, doesn't it? It sure does mine.